When OnePlus first launched their first phone, the OnePlus One, it was hailed as the “Flagship Killer” smartphone. It featured most of the high-end specifications that was found in a typical Android flagship at the time but only sold for a fraction the price. However, over the years OnePlus has slowly increased the price point of their phones within spitting distance of other Android flagships – Closing the gap between the once “Flagship Killer” brand and the more traditional Android OEMs. That is where Xiaomi steps in with Pocophone and their new “Flagship Killer”: the Pocophone F1. Priced at only a fraction of the price of OnePlus’ OnePlus 6 with comparable specs – Is the Pocophone F1 is the OnePlus killer? With a mostly plastic design, the Pocophone F1’s materials are unassuming and quite understated. However, underneath this humble polycarbonate body, packs some of the latest and greatest specifications that can be found in a smartphone to date. Armed with a Qualcomm Snapdragon 845, the Pocophone is blazingly fast in both heavyweight applications such as games and in everyday tasks. With what Xiaomi calls a “LiquidCool” cooling system, the Snapdragon 845 operates at optimal performance. Creating a lag smooth experience. Coupled with hundreds of deep-system optimizations, Poco optimized MIUI runs without a hitch and even rivals stock Android system experiences such as the one found on the Google Pixel or the OnePlus 6. The Pocophone F1’s display is another thing of beauty. Although it does have a notch on the top, the F1’s display comes with vibrant colors and impeccable sharpness due to its LCD technology. You may not get the infinite contrast ratio that is found in AMOLED but the quality of the LCD panel on the F1 rivals those of its flagship brothers such as the Mi MIX 2S or even the HTC U12+. With that being said, unlike other manufacturers who only use the notch as a way to cut their bezels, the Pocophone F1’s notch holds some impressive technology. 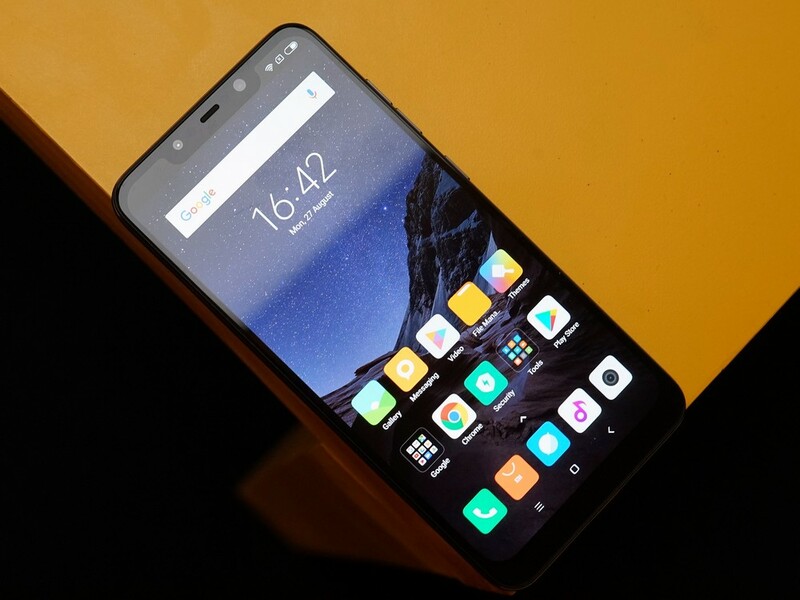 With an infrared illuminator and an infrared camera for secure facial recognition, Xiaomi managed to pack them in a relatively small notch that’s similar in length to an iPhone X. Although it may be a couple steps behind Apple’s proprietary technology, it is still a step-up over other “Selfie Camera” implementations. With such a bright and large display, the battery that powers the device has to be simply out of the world. But no worries! With a 4,000 mAh battery, the Pocophone F1 easily gets a light user 2 days of battery life, while heavier users should comfortably see a full day with a bit of battery left over at the end of the day. With all flagships having dual cameras or even triple camera setups, the Pocophone F1 follows the trend and comes with a dual camera setup. However, unlike most other flagships, the secondary camera is mainly used for improving the quality of the primary shooter. The primary camera itself is a large 12MP, 1.4µm pixel sensor and the secondary camera is a supplementary 5MP shooter that serves for improved depth information. In broad daylight, the pictures detailed and extremely sharp with little to no noise. Coupled with the extremely vibrant colors and excellent contrast ratio, most users should be extremely happy with the quality of the camera on the Pocophone F1. For pictures in lowlight, the proprietary HDR software offers sharp shots that captures the scene quite naturally. However, the omission of OIS does prevent the Pocophone from capturing the same quality that is found on more expensive flagships such as the Samsung Note9. With that being said, the front facing camera on the Pocophone is as excellent as the rear-facing cameras. With stunning detail and a very nice skin tone, the F1 is a very flattering choice when taking selfies. Pocophone has finally done what OnePlus couldn’t achieve in a long time – Create a flagship killer with out of the world specifications at a jaw droppingly low price. The F1 comes with a unique array of specs – infrared sensor for facial recognition, the latest Snapdragon top of the line chip, a massive battery for all day battery life and a stunning display. However instead of just making an alright device with high-end specifications, Xiaomi went ahead and created one of the best phones we have ever seen. The Pocophone F1 is by far the most affordable flagship that anybody can buy today and we would highly recommend the Pocophone F1 to anybody looking for a new mobile phone.